BERLIN: Reaching across gulfs of age, gender, faith, nationality and even international celebrity, the Norwegian Nobel Committee on Friday awarded the 2014 peace prize to Malala Yousafzai of Pakistan and Kailash Satyarthi of India, joining a teenage Pakistani known around the world with an Indian veteran of campaigns to end child labor and free children from trafficking. Malala, 17, is the youngest recipient of the $1.1 million prize since it was created in 1901. Satyarthi is 60. The awards were announced in Oslo by Thorbjorn Jagland, the committee's chairman, who said: "The Nobel Committee regards it as an important point for a Hindu and a Muslim, an Indian and a Pakistani, to join in a common struggle for education and against extremism." "Children must go to school and not be financially exploited," Jagland said. "It is a prerequisite for peaceful global development that the rights of children and young people be respected. In conflict-ridden areas in particular, the violation of children leads to the continuation of violence from generation to generation. "Showing great personal courage, Kailash Satyarthi, maintaining Gandhi's tradition, has headed various forms of protests and demonstrations, all peaceful, focusing on the grave exploitation of children for financial gain," Jagland said. "He has also contributed to the development of important international conventions on children's rights." Despite his works, Satyarthi is not nearly so widely known as Malala, who was shot in the head by the Taliban in 2012 for campaigning on behalf of girls' education in the Swat Valley of Pakistan. She was 15 at the time. Since then, she has become a global emblem of her struggle, celebrated on television and publishing a memoir. She "has already fought for several years for the right of girls to education and has shown by example that children and young people, too, can contribute to improving their own situations," Jagland said. "This she has done under the most dangerous circumstances. Through her heroic struggle, she has become a leading spokesperson for girls' rights to education." In the speculation that invariably precedes the announcement of the award, Malala had been a favorite for two successive years. This year, some forecasters spoke of Pope Francis, and others said it was likely the committee would withhold the prize, as it last did during the Vietnam War in 1972 because the global horizon seemed so scarred by conflict. The nomination of Malala, however, seemed in part to be intended as an inspirational message, offering a counterpoint to conflicts in Iraq, Syria, Yemen and elsewhere. Last year, Malala won several European awards and published a memoir of her experiences, "I Am Malala." The title echoed the circumstances of her shooting. When the Taliban gunman boarded her bus, he called out, "Who is Malala?" As she noted in an interview last year, her voice is now heard "in every corner of the world." British news reports said Malala was at school in Birmingham, England, where she has lived since being treated for her gunshot wounds, when the prize was announced and was taken out of her class to be informed of the award. In many ways, her story has come to symbolize the trauma of modern Pakistan, as the nuclear-armed nation has struggled to reconcile the opposing forces of violent Islamism and those who envision a progressive, forward-facing future for their country. The Taliban were the reason that Malala had come to public prominence. She wrote a blog in 2009 that detailed life in the Swat Valley under Taliban rule, at a time when bearded fighters, armed with Kalashnikovs, had terrorized the valley's residents and made particular efforts to shut schools where girls were being educated. After the Taliban were expelled from Swat, Malala went on to become a national media figure. Malala spoke passionately about the need for peace and education for girls on television programs. She was encouraged by her schoolmaster father, Ziauddin Yousafzai, who had nurtured his daughter as an outspoken advocate from an early age. But that advocacy earned the wrath of the Taliban, which convened a secret meeting to plan her assassination. In the months after her recovery, Malala took the first steps toward establishing her global celebrity. She met with President Barack Obama and his family in the White House and was lionized by a host of celebrities. News of the Nobel Prize on Friday inspired jubilation and well-wishers in the Swat Valley, who spilled onto the streets and distribute sweets in a traditional celebration. "We have no words to express our feelings," said Ahmad Shah, a family friend, speaking by phone from Mingora, the main town in the region. "Her efforts have been recognized by the world with this great prize. This is a victory for the people of Swat and of Pakistan." 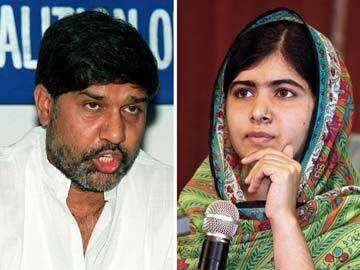 Shah said he had spoken to Malala's exiled father, who had called from England to gauge the reaction in the area. For months after the attack on Malala, some residents criticized the schoolgirl, fearing publicity around her case would invite further Taliban attacks. But now, Shah said he told her father by phone, "even those who were opposing Malala are happy." Some residents, however, clung to the conspiracy theories that have dogged Malala's reputation in Pakistan. "Her shooting was a ready-made drama that was created by foreign powers," said Ghulam Farooq, the editor of a small local newspaper. "She has no real role in this Swat conflict." In India, Satyarthi, a former engineer, has long been associated with the struggle to free bonded laborers, some born into their condition and others lured into servitude. For decades, he has sought to rid India of child slavery and has liberated more than 75,000 bonded and child laborers in the country. Satyarthi began working for children's rights in 1980 as the general secretary of the Bonded Labor Liberation Front, an organization dedicated to freeing bonded laborers forced to work to pay off debts, real or imagined. He also founded the Bachpan Bachao Andolan, or Save the Children Mission, an organization dedicated to ending bonded labor and saving children from trafficking. "This is a very happy moment for every Indian," he said in comments aired on the Indian news channel NDTV on Friday. "If with my humble efforts the voice of tens of millions of children in the world who are living in servitude is being heard, congratulations to all." For the previous two years, the prize had been awarded to international bodies: the Organization for the Prohibition of Chemical Weapons in 2013 and the European Union in 2012.